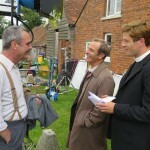 While it’s only been a mere eight months since series 3 of Grantchester ended last August on PBS, it has been a few weeks short of what has been a very long year since UK audiences witnessed Reverend Sidney Chambers’ tearful breakup with Amanda following her ultimatum that Sidney choose his faith or his love for her. As Sidney comes to the realization that the community needs him more than ever, he stays in Grantchester as Amanda heads off to London. 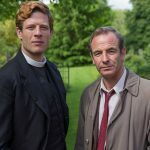 Much like its Oxford cousin Endeavour, Grantchester viewers have had their collective mind palaces soothed the last several years with the knowledge that the next series of their favorite vicar had been commissioned prior to the previous series finale. By the time the credits would begin to roll on the series finale, cast and crew would be gearing up to film the Christmas special followed by the next series that would traditionally follow in the Spring in the UK and the Summer in America. Not so this year. In what seems to be more the norm these days (did someone mention Sherlock? 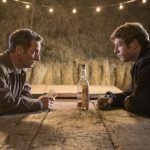 ), the hold-up seems to be more the inability to match up with James Norton’s schedule rather than whether or not ITV and PBS are wavering on its continuation. Needless to say, it’s been challenging to compete with the time constraints of filming Happy Valley, War and Peace and McMafia. 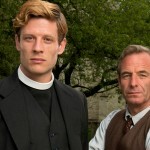 While other series such as Death in Paradise, MI5 and Doctor Who have thrived over the years in the wake of periodically changing lead actors, ITV and PBS’ conventional wisdom would lead you to believe that Grantchester would not survive without the likes of James Norton or Robson Green. 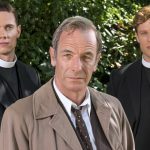 It may be some time before we cross paths with our favorite whiskey-swilling, jazz-loving, mystery-solving vicar but one can only hope that the streets of Grantchester will be safe for at least one more series in the not-too-distant future. Thoughts?